I spent this past weekend cheering on my favorite athletes, and looking forward to more of the same this week. Although the torch-lighting ceremony had a glitch, the world’s enthusiasm for the beloved Games shines bright. Courtesy of Camosun College in British Columbia. Last week I wrote about the 2010 Winter Olympics going green by offsetting carbon credits, a trend that will continue for many Olympic Games to come. The lesser-known 2010 British Columbia Games has taken energy savings to the next level with a new Olympic torch that draws less power than a household toaster! For over 30 years the government-funded BC Summer and BC Winter Games have been promoting healthier lifestyles in Canada, and today they are one of British Columbia’s largest sporting events. Until now the traditional torch has been burning natural gas, just like the International Olympic Torch. 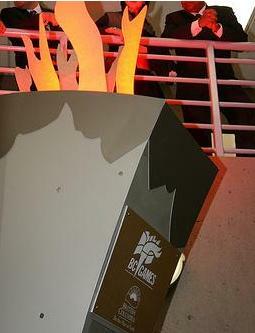 But this year the newly-redesigned BC Games torch is kinder to the environment, thanks to the efforts of BC’s Camosun College. The BC Games Society asked Camosun College to design a high-tech torch with a reduced environmental impact. The Camosun School of Trades and Technology came up with a novel torch that uses LED lights to create the illusion of a flickering flame. For the 100 days of the games the torch “burned” about 2,000 kWh of electricity and costing less than $2 a day to operate. This compares with the old natural gas torch that cost about $50 a day! What’s more, the college and the committee used an open innovation model to make it happen. The design project required a multidisciplinary effort that included participation from many diverse design teams in electrical, mechanical and manufacturing technology . I’m sure with only 300 LED’s, the spectacle isn’t as grand as an actual flame, but who knows what may be in store for the “torch” years from now as technology continues to develop.